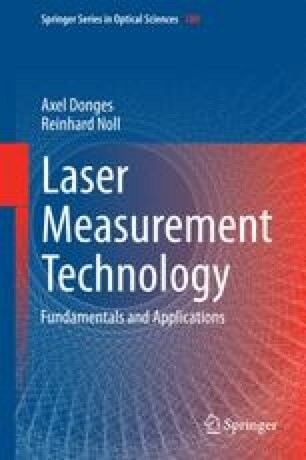 Laser triangulation is a method to measure the absolute distance to an object. The principle of triangulation is presented including the extensions to 2-D and 3-D measurements. We discuss the characteristic curve of laser triangulation, the implications of the laser beam propagation and the properties of the object surface. Examples of applications are given ranging from thickness measurements of rolled sheets, flatness measurements of heavy plates, coordinate-measuring machines to the straightness and profile measurement of rails.